With 416 rushing yards, including 121 against the Wolfpack, Lamar Jackson has set a single-season rushing record for a Louisville QB. There’s no more mystery. For the second straight season, NC State is left looking for answers after the start of ACC play. 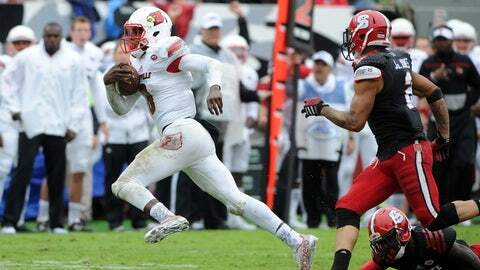 Meanwhile, Louisville looks to be growing increasingly dangerous with record-setting Lamar Jackson at the controls after beating the Wolfpack 20-13 Saturday. NC State had its doubters after a 4-0 start that included victories over two teams from the Sun Belt, Conference USA and FCS. The defense had been dominant, ranking third in FBS, allowing 205.8 yards per game, quarterback Jacoby Brissett — the ACC’s leader in pass efficiency (170.3) — was at the helm of an offense scoring 46.3 per (ninth) and the Wolfpack was the only team in the nation to commit a single turnover through four games. Nearly every one of those strengths disappeared against the Cardinals. NC State gave up 306 yards, including 203 on the ground, was held more than 30 points below its average and committed two turnovers, including one in the first quarter when Jumichael Ramos’ turned a 48-yard catch into a turnover inside the 10-yard line. The Wolfpack clearly missed troubled running back Shadrach Thonrton, who was dismissed from the team Wednesday after he hit a pedestrian on a moped. Thornton was the first two games of the season for a violation of team rules, but returned with 203 yards and three touchdowns in three games. He formed a strong tandem with Matthew Dayes, who came in with four straight 100-yard games and nine scores. But Louisville, which had struggled against the rush through its first four games, allowing 172.3 per (77th) held him to just 68 yards. One positive was Dayes again reached the end zone on a 3-yard run in the second quarter to make it 14-7. Another was Brissett, who continues his efficient play and has now gone 201 straight passes without throwing an interception. That he didn’t throw one was of note, considering the Cardinals came in riding a nation’s best streak of 17 games with a pick. NC State coach Dave Doeren said earlier this week he’d hoped his team had grown from last season, when they followed a 4-0 start by losing to No. 1 Florida State and then lost four in a row overall. The Wolfpack will try to avoid a similar slide with a schedule that includes free-falling Virginia Tech and Wake Forest before hosting No. 12 Clemson on Oct. 31. Bobby Petrino had shuffled his QBs in and out during much of the first month, but he appears to have found an answer in Jackson. The freshman has run for 416 yards, which is already a single-season Cardinals record for a QB, with 121 and a score on 19 carries Saturday. He also threw for two more scores, along with 103 yards on 10 of 27 passing. While the Cardinals started 0-3, that included losses of seven points to No. 6 Auburn and Houston, then another by three points against No. 11 Clemson. Keep this in mind. Louisville’s Oct. 17 opponent — No. 11 Florida State — represents the only remaining ranked team on the schedule. If noted QB guru Petrino has found some stability at the position in Jackson, and his defense continues to live up to its promise (allowing 11 ppg the last three weeks), the Cardinals could yet make some noise in the Atlantic Division. As for NC State, it has a short week to try and regroup and prove it can avoid a similar fall like it had in ’14.